Sometimes only a regular cupcake will do. It’s not a question I thought I’d be asking as I commenced my nutrition career over 10 years ago. Back then, part of our training was all about learning how to motivate people to not eat cupcakes every day. Now a paleo, gluten free, dairy free, raw, vegan cupcake, with ‘unrefined sugar’ seems to be the norm. Every second cafe is spruiking their whole food, guilt free, superfood rich, macca powder filled, spirulina goodness (I’m perplexed as to why we even die), ‘healthy’ treats and I’m feeling overwhelmed. To be honest, I don’t want one of those friggin’ ‘healthy’ cupcakes. I just want a regular cupcake. Pause, get some self-awareness, assess your desire and need for a particular food and then make a conscious choice to either eat it or not. The point of the exercise has nothing to do with what your choice actually is, it’s about being happy with your choice. I believe the reason we often feel so much guilt about food is because we want to eat one way (healthier) yet end up doing the complete opposite. It’s the internal conflict that makes us feel so frustrated and unhappy with ourselves. Trust your body, that when you actually think about how it feels and what it needs, that you’ll make a healthy choice. Occasionally, you’ll choose to eat the cupcake and thats ok too. Eat it and enjoy every last mouthful of it. Don’t waste it by feeling guilting and beating yourself up. One cupcake doesn’t need to spiral into five. Ok, so I’m at The Cupping Room. I see this epic cupcake glinting at me behind the glass. Cheeky bugger. It wanted me bad. I wanted it too, but I had reservations. I decided that I would only partake if it was a regular cupcake. I didn’t want a gluten free, vegan or raw cupcake. If it was paleo, I was not interested. Not because I’m against those things, it’s just that I haven’t had good experiences with these particular versions and if I’m going to eat a cupcake it’s got to be so delicious that I could die. So, basically, if it had wheat, dairy and sugar than that sucker was mine. She looked perplexed by the question. I repeated myself. She still looked confused and half-nodded a yes. She smiled as she’d finally understood me. As the decadent morsel was placed in front of me, I batted my husband’s fork away. This bad boy was mine. Once I took the obligatory instagram shot, I removed all distractions and took a bite. Oh… I. Can’t. Even. It was every thing I’d hoped and dreamed it would be. Every mouthful was a delight that I savoured and still didn’t share with my husband. I mean, where does he get off thinking he can eat my cupcake? Ok, so I’m five bites in and it’s all becoming very clear. What started with sparks and a promise of lifetime pleasure quickly turned into the feeling that you get when you’ve consumed a decent amount of sugar and now it’s time to stop. I sighed and pushed back the plate. If I smoked, I felt like now would have been a good time to light up. What a moment wed had together. That regular cupcake and me. 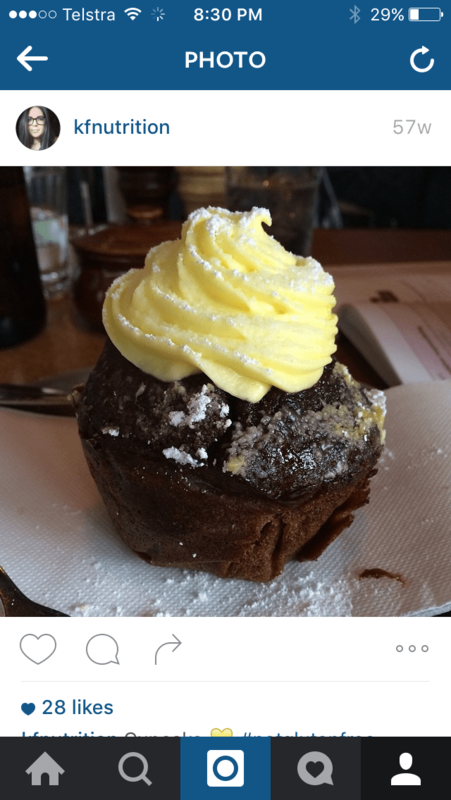 In the end, one cupcake, in the context of a healthy, balanced diet is completely fine and won’t send my body spiralling into inflammation and disease. As a nutritionist, I’d prefer people to be happy with their food choices rather than ‘try’ to eat healthy by following rules full of dos and don’ts. I don’t know about you but rules tend to get broken and often people deviate so far from them that a whole batch of cupcakes is demolished in one sitting rather than just one. Healthy eating is more about what you do eat rather than what you don’t eat. You could eat a cupcake daily, but if you also eat large amounts of green vegetables, a variety of other vegetables, a couple of pieces of fruit, some whole nuts and seeds, a serve of legumes and/or high fibre gains, than keep eating your blessed cupcake cause you’re likely living a long and healthy life. Research tells us that despite other lifestyle factors that contribute to disease, if you consume five or more serves of vegetables and fruit per day you decrease your risk of death from heart disease and cancer by up to 20%! Huge! Many ‘healthy experts’ would have you believe that unless your diet is 100% ‘clean’ than you’re doomed to poor health, but this is simply not true. And many people that attempt to achieve a 100% ‘clean’ diet, end up finding themselves in a disordered eating pattern of food restriction or swinging to the opposite extreme of eating every sugary item in sight! Moderation truly is the answer you’ve been looking for, it just takes practice to find the balance thats right for you. And thats ok, you’ve got your whole life to work on it. Not just 12 weeks. Now if you choose gluten free, diary free, raw, vegan and paleo because that’s your preference (or health requirements) thats completely fine and I have not problems with your choice at all. So long as it’s choice-based and not rules-based, then you can eat however you like. Be educated about your choices, take things you read on Google with a grain of salt and feel good about your choices and how you’re eating. If you’re not happy with your food choices or eating makes you feel guilty, anxious, stressed, unwell, lacking in energy, or you’re gradually putting on weight over time please come and see my team at The Healthy Eating Hub. We do simple, fresh, balanced advice, free of rules, fads and gimmicks. Just everyday nutrition for everyday people.